Saute the onion, carrots and garlic in the butter, until the onions are starting to brown and the carrots are slightly golden. Add salt, pepper and spices and continue to cook on medium heat for another 5 minutes. Next, transfer to a large stock pot, and add enough water to cover the carrots and add the bullion. Cook on medium heat for about 30 – 45 minutes, until carrots are tender. Add milk and orange juice and heat through. 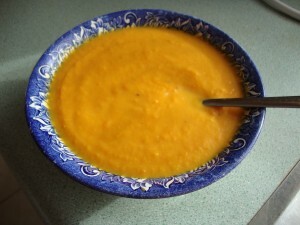 Puree in a blender or with hand blender, and serve either warm, or chill and serve several hours later. Sounds tasty, but chilled? In January?? I tried it both ways. I *preferred* it hot, but it was very flavourful cold as well!